This is an extract of wholesome paleo recipes from Teresa Cutter’s bestselling cookbook Purely Delicious. The Paleo diet or what's also known as the primal diet, is eating foods as close to its natural state. These foods include fresh fruits and vegetables, lean protein sources such as wild caught fish, organic eggs and grass-fed meat, plus raw nuts and seeds. When I was first introduced to this primal way of eating years ago, I noticed that I was able to reach my performance and weight loss goals, and I also had so much energy than ever before. Even if you're not Paleo, I hope this book will help you discover how delicious and easy it is to enjoy fresh, wholefood ingredients. 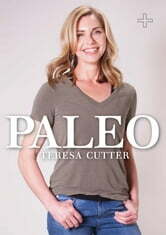 Teresa Cutter is the founder of The Healthy Chef, wellness expert and leading authority on healthy cooking. She is also the #1 bestselling wholefood author of The Healthy Chef - Purely Delicious cookbook.